That means that by the time my payment is even due, that will be closer to $200. If I make that $113 payment it will just cause my loans to increase and that interest will be added to the balance of my loans. It seems like instead of a 10-year payment plan that FedLoan Servicing has me on the ‘forever’ payment program. Aren’t there rules against minimum payments being this low and having loans just constantly accrue interest? It doesn’t seem fair, and if someone was only making minimum payments and not paying attention they could really get screwed over here. Unfortunately I’m not really sure what the difference between outstanding interest and interest balance is. To me that would be the same thing on these loans? Outstanding interest is the only thing I can seem to find on their website. It’s obviously something else because I get my monthly payment to be $129 which does not make any sense. I think I will have to ask them about that. 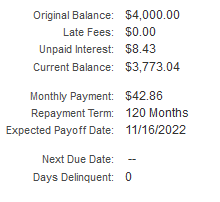 As you can see, one loan actually has a monthly payment while the other loan does not even have a monthly payment due! Yet interest is still accruing on it. 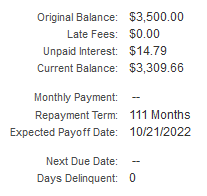 And not to mention that neither loan has a next due date according to this section of their website. Once again I’m starting to get that strange feeling that I’m on the ‘forever’ payment plan and that something weird is going on here. I absolutely plan on calling them either today or tomorrow in an attempt to figure this out. Does anyone have any idea what is going on here? Am I reading into this wrong? You’ve likely paid more than the minimum on some of the loans so your next due date could be months from now and their systems won’t say you owe anything until that time comes around? I always make my payments (at least twice a month) based on the unpaid/accrued interest. Did they really give you that formula? That makes me want to cry! Interest balance is probably any accrued/unpaid interest. Outstanding interest is probably capitalized interest that has been added to your principal. Yeah that’s basically what they are doing. Everything over the minimum amount counts towards future payments. But I want to be able to control my payments and put extra towards the principal on the higher interest ones. I think I finally have that fixed now. Yes they did! And it wasn’t even relevant to my question really – I’m going to just assume the minimum payments are right after reading all that 😉 Those definitions would make sense…but that also means I can’t really see the outstanding interest if it was already added to my principal.